I am kicking off a new series to share some of what inspired+grabbed my heart this week. White tulips: I love this time of year because it is bulb season. And my very favorite, white tulips, opened up in my window sill this week bringing a smile to my face every time I looked at them. Yay – Spring is near! TWLOHA: Heavy and Light Tour: On Tuesday, I was invited by TWLOHA (To Write Love on Her Arms) to attend a special concert intending to do more than just promote awareness about mental illness, suicide prevention and self-harm behaviors. They wanted to move me. And they did, indeed. Megan and I were watching the crowd as much as we enjoyed the talent from the stage. It was a crowd of people who clearly felt understood, valued, respected, less alone in this space. In a world of masks and “Everything is fine” this was a room full of people wearing their hard knocks visibly on their faces, their bodies. It was an honor to have Potentia included on a list of local resources, along with other amazing colleagues of mine, TWLOHA provided to everyone in attendance. The core messages of the night: Reach out, get help, speak your pain, break the silence and share your story. You are not alone. Amen. Abby Kerr and her Voice Bureau: I am fairly new to Abby’s world but I love her work and really appreciate her voice. I am also a word nerd. And I tend to be a little protective of words that are meaningful to me while regularly cringing at some verbiage regularly used in written and spoken form. Her recent post on buzz words that need to retire had me nodding in agreement. And the discussion that ensued in the comments section was insightful and also hilarious. As a therapist, I work with people in finding their own unique, powerful voice. Though Abby is speaking to business owners and entrepreneurs, I love her Voice Values (scroll down on her Pinterest page to check the breakdown of her VV’s) and think it is a helpful tool for anyone seeking to get clear on their voice – written and spoken. 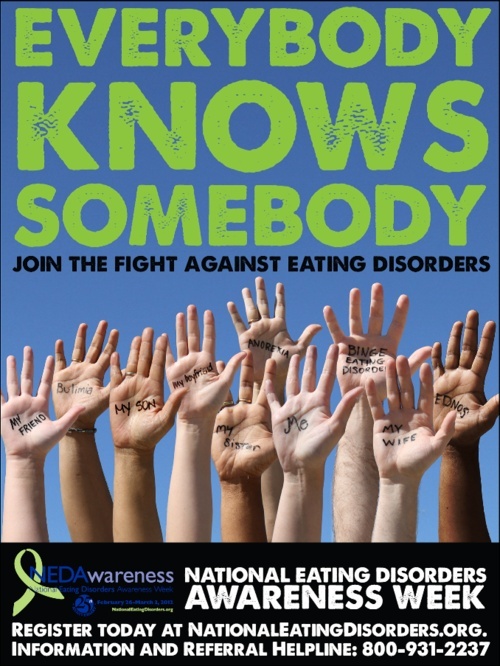 NEDA: February Kicks off National Eating Disorder Awareness Month. The last week of February, the National Eating Disorder Association hosts a week of coordinated awareness events about Eating Disorders, Disordered Eating and Negative Body Image. Check out what is going on in your local area and take some time to peruse the site and learn more about eating disorders, disordered eating and related issues. Eating disorders are so complex, so misunderstood, so devastating. Everybody Knows Somebody. But not everyone knows what to do when they know someone really struggling with food and body issues. NEDA is one of my favorite resources for education and advocacy. There is no reason to not be aware. Take the time to learn more about the most deadly of all mental illnesses and do not look the other way. Lives are at stake. Ann Voskamp’s 25 Point Manifesto for Sanity in 2013: For the soul. I am usually skeptical of reading the various manifestos I see out and about on the Internet. Yet, I was so curious to read Ann’s words, as they are like a cool glass of water on a hot day every time my eyes read her blog. 4, 7, 8 were spot on for me… and wow, loved the quote from number 12 “Constant connectivity affects productivity like a marijuana high.” Unplugging is so important to my mental health but one I find so tricky to do at this season of life where I have limited windows of time to work+create. But after a week of burning the candle at both ends, my mind, body and soul need to unplug, reconnect and restore. Oh and, number 23. Breathe. Deep, intentional breathing is non-negotiable to staying present and clear. Megan Aumann: A little over a year and a half ago, I met Megan. I immediately knew if I was her neighbor, we would become fast friends. And that I would spend a lot of time playing in her studio. Megan is a kind+spunky+oh so very smart woman who is working her talents as a business woman, an artist and a thought leader. I really like her jewelry and was blown away by how light the pieces are when worn. I am currently drooling over this necklace. I would love to have her do a trunk show at Potentia sometime… I think it would be so fun yet so dangerous to my pocketbook. Check out her blog and see her amazing booth she had at a show in NYC this week. Creative+Classy. Shoot Christians Say. Hilarious+Spot on. I know many people who resonate with the point of this video and have been sharing it with clients and friends all week. Props to Nikki Rollo from Reasons for making me aware of this funny+cringe-worthy parody. What inspired you this week? Do share. I really want to know. Have a wonderful weekend and take care of your amazing heart.